R interface to Apache Spark, a fast and general engine for big data processing, see < http://spark.apache.org>. This package supports connecting to local and remote Apache Spark clusters, provides a 'dplyr' compatible back-end, and provides an interface to Spark's built-in machine learning algorithms. Install and connect to Spark using YARN, Mesos, Livy or Kubernetes. Use dplyr to filter and aggregate Spark datasets and streams then bring them into R for analysis and visualization. Use MLlib, H2O, XGBoost and GraphFrames to train models at scale in Spark. Create interoperable machine learning pipelines and productionize them with MLeap. Create extensions that call the full Spark API or run distributed R code to support new functionality. If you use the RStudio IDE, you should also download the latest preview release of the IDE which includes several enhancements for interacting with Spark (see the RStudio IDE section below for more details). The returned Spark connection (sc) provides a remote dplyr data source to the Spark cluster. For more information on connecting to remote Spark clusters see the Deployment section of the sparklyr website. We can now use all of the available dplyr verbs against the tables within the cluster. For additional documentation on using dplyr with Spark see the dplyr section of the sparklyr website. You can orchestrate machine learning algorithms in a Spark cluster via the machine learning functions within sparklyr. These functions connect to a set of high-level APIs built on top of DataFrames that help you create and tune machine learning workflows. Here’s an example where we use ml_linear_regression to fit a linear regression model. We’ll use the built-in mtcars dataset, and see if we can predict a car’s fuel consumption (mpg) based on its weight (wt), and the number of cylinders the engine contains (cyl). We’ll assume in each case that the relationship between mpg and each of our features is linear. For linear regression models produced by Spark, we can use summary() to learn a bit more about the quality of our fit, and the statistical significance of each of our predictors. Spark machine learning supports a wide array of algorithms and feature transformations and as illustrated above it’s easy to chain these functions together with dplyr pipelines. To learn more see the machine learning section. You can read and write data in CSV, JSON, and Parquet formats. Data can be stored in HDFS, S3, or on the local filesystem of cluster nodes. ##  "batting"      "flights"      "iris"         "iris_csv"
The facilities used internally by sparklyr for its dplyr and machine learning interfaces are available to extension packages. Since Spark is a general purpose cluster computing system there are many potential applications for extensions (e.g. interfaces to custom machine learning pipelines, interfaces to 3rd party Spark packages, etc.). To learn more about creating extensions see the Extensions section of the sparklyr website. The RStudio IDE features for sparklyr are available now as part of the RStudio Preview Release. Livy enables remote connections to Apache Spark clusters. 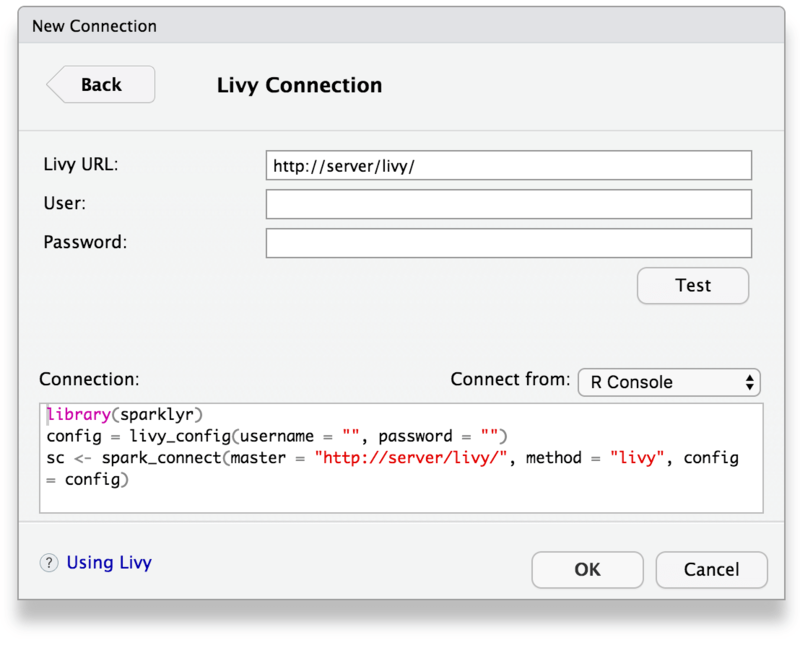 Connecting to Spark clusters through Livy is under experimental development in sparklyr. Please post any feedback or questions as a GitHub issue as needed. Support for Apache Arrow using the arrow package. The dataset parameter for estimator feature transformers has been deprecated (#1891). ml_multilayer_perceptron_classifier() gains probabilistic classifier parameters (#1798). Removed support for all undocumented/deprecated parameters. These are mostly dot case parameters from pre-0.7. Remove support for deprecated function(pipeline_stage, data) signature in sdf_predict/transform/fit functions. Soft deprecate sdf_predict/transform/fit functions. Users are advised to use ml_predict/transform/fit functions instead. Utilize the ellipsis package to provide warnings when unsupported arguments are specified in ML functions. Support for sparklyr extensions when using Livy. Significant performance improvements by using version in spark_connect() which enables using the sparklyr JAR rather than sources. Improved memory use in Livy by using string builders and avoid print backs. Fix for DBI::sqlInterpolate() and related methods to properly quote parameterized queries. copy_to() names tables sparklyr_tmp_ instead of sparklyr_ for consistency with other temp tables and to avoid rendering them under the connections pane. copy_to() and collect() are not re-exported since they are commonly used even when using DBI or outside data analysis use cases. Support for reading path as the second parameter in spark_read_*() when no name is specified (e.g. spark_read_csv(sc, "data.csv")). Support for batches in sdf_collect() and dplyr::collect() to retrieve data incrementally using a callback function provided through a callback parameter. Useful when retrieving larger datasets. Support for batches in sdf_copy_to() and dplyr::copy_to() by passing a list of callbacks that retrieve data frames. Useful when uploading larger datasets. spark_read_source() now has a path parameter for specifying file path. Support for whole parameter for spark_read_text() to read an entire text file without splitting contents by line. Local connection defaults now to 2GB. Support to install and connect based on major Spark versions, for instance: spark_connect(master = "local", version = "2.4"). Support for installing and connecting to Spark 2.4. Faster retrieval of string arrays. New YARN action under RStudio connection pane extension to launch YARN UI. Configurable through the sparklyr.web.yarn configuration setting. Support for property expansion in yarn-site.xml (@lgongmsft, #1876). The memory parameter in spark_apply() now defaults to FALSE when the name parameter is not specified. Remove exported ensure_ functions which were deprecated. Fixed missing Hive tables not rendering under some Spark distributions (#1823). 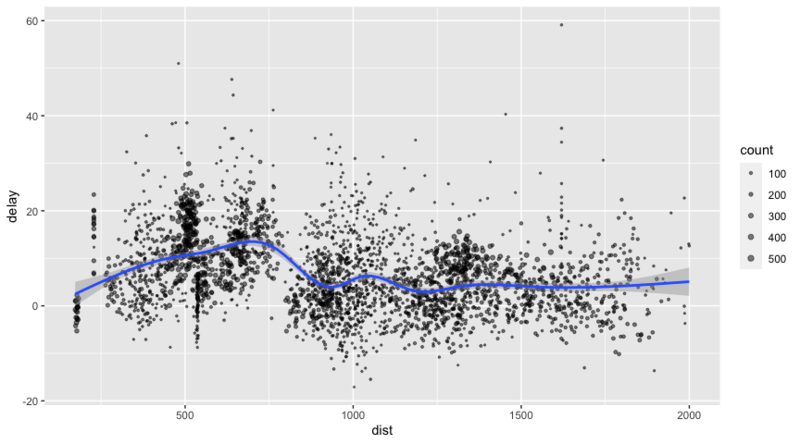 Fixed re-entrancy job progress issues when running RStudio 1.2. Tables with periods supported by setting sparklyr.dplyr.period.splits to FALSE. sdf_len(), sdf_along() and sdf_seq() default to 32 bit integers but allow support for 64 bits through bits parameter. Support for detecting Spark version using spark-submit. Improved multiple streaming documentation examples (#1801, #1805, #1806). Fix issue while printing Spark data frames under tibble 2.0.0 (#1829). Support for stream_write_console() to write to console log. Support for stream_read_scoket() to read socket streams. Fix to spark_read_kafka() to remove unused path. Fix to make spark_config_kubernetes() work with variable jar parameters. Support to install and use Spark 2.4.0. Improvements and fixes to spark_config_kubernetes() parameters. Support for sparklyr.connect.ondisconnect config setting to allow cleanup of resources when using kubernetes. Fix tableName warning triggered while connecting. Fix requirement to specify SPARK_HOME_VERSION when version parameter is set in spark_connect(). Cloudera autodetect Spark version improvements. Fixed default for session in reactiveSpark(). Removed stream_read_jdbc() and stream_write_jdbc() since they are not yet implemented in Spark. Support for collecting NA values from logical columns (#1729). Proactevely clean JVM objects when R object is deallocated. Fix installation error with older versions of rstudioapi (#1716). Fix missing callstack and error case while logging in spark_apply(). Fix regression in sdf_collect() failing to collect tables. Fix new connection RStudio selectors colors when running under OS X Mojave. Support for launching Livy logs from connection pane. Removed overwrite parameter in spark_read_table() (#1698). Fix regression preventing using R 3.2 (#1695). Terminate streams when Shiny app terminates. Fix dplyr::collect() with Spark streams and improve printing. Fix regression in sparklyr.sanitize.column.names.verbose setting which would cause verbose column renames. Fix to stream_write_kafka() and stream_write_jdbc(). Support for stream_read_*() and stream_write_*() to read from and to Spark structured streams. Support for dplyr, sdf_sql(), spark_apply() and scoring pipeline in Spark streams. Support for reactiveSpark() to create a shiny reactive over a Spark stream. Support for convenience functions stream_*() to stop, change triggers, print, generate test streams, etc. Support for interrupting long running operations and recover gracefully using the same connection. Support cancelling Spark jobs by interrupting R session. Support for monitoring job progress within RStudio, required RStudio 1.2. Progress reports can be turned off by setting sparklyr.progress to FALSE in spark_config(). Added config sparklyr.gateway.routing to avoid routing to ports since Kubernetes clusters have unique spark masters. Change backend ports to be choosen deterministically by searching for free ports starting on sparklyr.gateway.port which default to 8880. This allows users to enable port forwarding with kubectl port-forward. Added support to set config sparklyr.events.aftersubmit to a function that is called after spark-submit which can be used to automatically configure port forwarding. Added support for spark_submit() to assist submitting non-interactive Spark jobs. (Breaking change) The formula API for ML classification algorithms no longer indexes numeric labels, to avoid the confusion of 0 being mapped to "1" and vice versa. This means that if the largest numeric label is N, Spark will fit a N+1-class classification model, regardless of how many distinct labels there are in the provided training set (#1591). Fix retrieval of coefficients in ml_logistic_regression() (@shabbybanks, #1596). (Breaking change) For model objects, lazy val and def attributes have been converted to closures, so they are not evaluated at object instantiation (#1453). Input and output column names are no longer required to construct pipeline objects to be consistent with Spark (#1513). Vector attributes of pipeline stages are now printed correctly (#1618). Deprecate various aliases favoring method names in Spark. Deprecate incompatible signatures for sdf_transform() and ml_transform() families of methods; the former should take a tbl_spark as the first argument while the latter should take a model object as the first argument. Implemented support for DBI::db_explain() (#1623). Fixed for timestamp fields when using copy_to() (#1312, @yutannihilation). Added support to read and write ORC files using spark_read_orc() and spark_write_orc() (#1548). Fixed must share the same src error for sdf_broadcast() and other functions when using Livy connections. Added support for logging sparklyr server events and logging sparklyr invokes as comments in the Livy UI. Added support to open the Livy UI from the connections viewer while using RStudio. Improve performance in Livy for long execution queries, fixed livy.session.command.timeout and support for livy.session.command.interval to control max polling while waiting for command response (#1538). Fixed Livy version with MapR distributions. Removed install column from livy_available_versions(). Added name parameter to spark_apply() to optionally name resulting table. Fix to spark_apply() to retain column types when NAs are present (#1665). spark_apply() now supports rlang anonymous functions. For example, sdf_len(sc, 3) %>% spark_apply(~.x+1). Breaking Change: spark_apply() no longer defaults to the input column names when the columns parameter is nos specified. Support for reading column names from the R data frame returned by spark_apply(). Fix to support retrieving empty data frames in grouped spark_apply() operations (#1505). Added support for sparklyr.apply.packages to configure default behavior for spark_apply() parameters (#1530). Added support for spark.r.libpaths to configure package library in spark_apply() (#1530). Default to Spark 2.3.1 for installation and local connections (#1680). ml_load() no longer keeps extraneous table views which was cluttering up the RStudio Connections pane (@randomgambit, #1549). Avoid preparing windows environment in non-local connections. The ensure_* family of functions is deprecated in favor of forge which doesn't use NSE and provides more informative errors messages for debugging (#1514). Support for sparklyr.invoke.trace and sparklyr.invoke.trace.callstack configuration options to trace all invoke() calls. Support to invoke methods with char types using single character strings (@lawremi, #1395). Fixed collection of Date types to support correct local JVM timezone to UTC (). Many new examples for ft_binarizer(), ft_bucketizer(), ft_min_max_scaler, ft_max_abs_scaler(), ft_standard_scaler(), ml_kmeans(), ml_pca(), ml_bisecting_kmeans(), ml_gaussian_mixture(), ml_naive_bayes(), ml_decision_tree(), ml_random_forest(), ml_multilayer_perceptron_classifier(), ml_linear_regression(), ml_logistic_regression(), ml_gradient_boosted_trees(), ml_generalized_linear_regression(), ml_cross_validator(), ml_evaluator(), ml_clustering_evaluator(), ml_corr(), ml_chisquare_test() and sdf_pivot() (@samuelmacedo83). Added spark_config_settings() to list all sparklyr configuration settings and describe them, cleaned all settings and grouped by area while maintaining support for previous settings. Static SQL configuration properties are now respected for Spark 2.3, and spark.sql.catalogImplementation defaults to hive to maintain Hive support (#1496, #415). spark_config() values can now also be specified as options(). Support for functions as values in entries to spark_config() to enable advanced configuration workflows. Added support for spark_session_config() to modify spark session settings. Added support for sdf_debug_string() to print execution plan for a Spark DataFrame. Fixed DESCRIPTION file to include test packages as requested by CRAN. Support for sparklyr.spark-submit as config entry to allow customizing the spark-submit command. Changed spark_connect() to give precedence to the version parameter over SPARK_HOME_VERSION and other automatic version detection mechanisms, improved automatic version detection in Spark 2.X. Fixed sdf_bind_rows() with dplyr 0.7.5 and prepend id column instead of appending it to match behavior. broom::tidy() for linear regression and generalized linear regression models now give correct results (#1501). Support for Spark 2.3 in local windows clusters (#1473). Support for resource managers using https in yarn-cluster mode (#1459). Fixed regression for connections using Livy and Spark 1.6.X. Fixed regression for connections using mode with databricks. Added ml_validation_metrics() to extract validation metrics from cross validator and train split validator models. ml_transform() now also takes a list of transformers, e.g. the result of ml_stages() on a PipelineModel (#1444). Added collect_sub_models parameter to ml_cross_validator() and ml_train_validation_split() and helper function ml_sub_models() to allow inspecting models trained for each fold/parameter set (#1362). Added parallelism parameter to ml_cross_validator() and ml_train_validation_split() to allow tuning in parallel (#1446). Added support for feature_subset_strategy parameter in GBT algorithms (#1445). Added string_order_type to ft_string_indexer() to allow control over how strings are indexed (#1443). Added ft_string_indexer_model() constructor for the string indexer transformer (#1442). Added ml_feature_importances() for extracing feature importances from tree-based models (#1436). ml_tree_feature_importance() is maintained as an alias. Added ml_vocabulary() to extract vocabulary from count vectorizer model and ml_topics_matrix() to extract matrix from LDA model. ml_tree_feature_importance() now works properly with decision tree classification models (#1401). Added ml_corr() for calculating correlation matrices and ml_chisquare_test() for performing chi-square hypothesis testing (#1247). ml_save() outputs message when model is successfully saved (#1348). ml_ routines no longer capture the calling expression (#1393). Added support for offset argument in ml_generalized_linear_regression() (#1396). Fixed regression blocking use of response-features syntax in some ml_functions (#1302). Added support for Huber loss for linear regression (#1335). ft_bucketizer() and ft_quantile_discretizer() now support multiple input columns (#1338, #1339). ml_default_stop_words() now returns English stop words by default (#1280). Fixed regression blocking use of ml_kmeans() in Spark 1.6.x. invoke*() method dispatch now supports Char and Short parameters. Also, Long parameters now allow numeric arguments, but integers are supported for backwards compatibility (#1395). invoke_static() now supports calling Scala's package objects (#1384). spark_connection and spark_jobj classes are now exported (#1374). Added support for profile parameter in spark_apply() that collects a profile to measure perpformance that can be rendered using the profvis package. Added support for spark_apply() under Livy connections. Fixed file not found error in spark_apply() while working under low disk space. Added support for sparklyr.apply.options.rscript.before to run a custom command before launching the R worker role. Added support for sparklyr.apply.options.vanilla to be set to FALSE to avoid using --vanilla while launching R worker role. Fixed serialization issues most commonly hit while using spark_apply() with NAs (#1365, #1366). Fixed issue with dates or date-times not roundtripping with `spark_apply() (#1376). Fixed data frame provided by spark_apply() to not provide characters not factors (#1313). Fixed typo in sparklyr.yarn.cluster.hostaddress.timeot (#1318). Fixed regression blocking use of livy.session.start.timeout parameter in Livy connections. Added support for Livy 0.4 and Livy 0.5. Livy now supports Kerberos authentication. Default to Spark 2.3.0 for installation and local connections (#1449). yarn-cluster now supported by connecting with master="yarn" and config entry sparklyr.shell.deploy-mode set to cluster (#1404). sdf_copy_to() no longer gives a spurious warning when user enters a multiline expression for x (#1386). spark_available_versions() was changed to only return available Spark versions, Hadoop versions can be still retrieved using hadoop = TRUE. spark_installed_versions() was changed to retrieve the full path to the installation folder. cbind() and sdf_bind_cols() don't use NSE internally anymore and no longer output names of mismatched data frames on error (#1363). Added support for Spark 2.2.1. Switched copy_to serializer to use Scala implementation, this change can be reverted by setting the sparklyr.copy.serializer option to csv_file. Added support for spark_web() for Livy and Databricks connections when using Spark 2.X. Fixed SIGPIPE error under spark_connect() immediately after a spark_disconnect() operation. spark_web() is is more reliable under Spark 2.X by making use of a new API to programmatically find the right address. Added support in dbWriteTable() for temporary = FALSE to allow persisting table across connections. Changed default value for temporary to TRUE to match DBI specification, for compatibility, default value can be reverted back to FALSE using the sparklyr.dbwritetable.temp option. ncol() now returns the number of columns instead of NA, and nrow() now returns NA_real_. Added support to collect VectorUDT column types with nested arrays. Fixed issue in which connecting to Livy would fail due to long user names or long passwords. Fixed error in the Spark connection dialog for clusters using a proxy. Improved support for Spark 2.X under Cloudera clusters by prioritizing use of spark2-submit over spark-submit. Livy new connection dialog now prompts for password using rstudioapi::askForPassword(). Added schema parameter to spark_read_parquet() that enables reading a subset of the schema to increase performance. Implemented sdf_describe() to easily compute summary statistics for data frames. Fixed data frames with dates in spark_apply() retrieved as Date instead of doubles. Added support to use invoke() with arrays of POSIXlt and POSIXct. Added support for context parameter in spark_apply() to allow callers to pass additional contextual information to the f() closure. Implemented workaround to support in spark_write_table() for mode = 'append'. Various ML improvements, including support for pipelines, additional algorithms, hyper-parameter tuning, and better model persistence. Added spark_read_libsvm() for reading libsvm files. Added support for separating struct columns in sdf_separate_column(). Fixed collection of short, float and byte to properly return NAs. Added sparklyr.collect.datechars option to enable collecting DateType and TimestampTime as characters to support compatibility with previos versions. Fixed collection of DateType and TimestampTime from character to proper Date and POSIXct types. Added support for HTTPS for yarn-cluster which is activated by setting yarn.http.policy to HTTPS_ONLY in yarn-site.xml. Added support for sparklyr.yarn.cluster.accepted.timeout under yarn-cluster to allow users to wait for resources under cluster with high waiting times. Fix to spark_apply() when package distribution deadlock triggers in environments where multiple executors run under the same node. Added support in spark_apply() for specifying a list of packages to distribute to each worker node. Added support inyarn-cluster for sparklyr.yarn.cluster.lookup.prefix, sparklyr.yarn.cluster.lookup.username and sparklyr.yarn.cluster.lookup.byname to control the new application lookup behavior. Enabled support for Java 9 for clusters configured with Hadoop 2.8. Java 9 blocked on 'master=local' unless 'options(sparklyr.java9 = TRUE)' is set. Fixed issue in spark_connect() where using set.seed() before connection would cause session ids to be duplicates and connections to be reused. Fixed issue in spark_connect() blocking gateway port when connection was never started to the backend, for isntasnce, while interrupting the r session while connecting. Performance improvement for quering field names from tables impacting tables and dplyr queries, most noticeable in na.omit with several columns. Fix to spark_apply() when closure returns a data.frame that contains no rows and has one or more columns. Fix to spark_apply() while using tryCatch() within closure and increased callstack printed to logs when error triggers within closure. Added support for the SPARKLYR_LOG_FILE environment variable to specify the file used for log output. Fixed regression for union_all() affecting Spark 1.6.X. Added support for na.omit.cache option that when set to FALSE will prevent na.omit from caching results when rows are dropped. Added support in spark_connect() for yarn-cluster with hight-availability enabled. Added support for spark_connect() with master="yarn-cluster" to query YARN resource manager API and retrieve the correct container host name. Fixed issue in invoke() calls while using integer arrays that contain NA which can be commonly experienced while using spark_apply(). Added topics.description under ml_lda() result. Added support for ft_stop_words_remover() to strip out stop words from tokens. Feature transformers (ft_* functions) now explicitly require input.col and output.col to be specified. Added support for spark_apply_log() to enable logging in worker nodes while using spark_apply(). Fix to spark_apply() for SparkUncaughtExceptionHandler exception while running over large jobs that may overlap during an, now unnecesary, unregister operation. Fix race-condition first time spark_apply() is run when more than one partition runs in a worker and both processes try to unpack the packages bundle at the same time. spark_apply() now adds generic column names when needed and validates f is a function. Improved documentation and error cases for metric argument in ml_classification_eval() and ml_binary_classification_eval(). Fix to spark_install() to use the /logs subfolder to store local log4j logs. Fix to spark_apply() when R is used from a worker node since worker node already contains packages but still might be triggering different R session. Fix connection from closing when invoke() attempts to use a class with a method that contains a reference to an undefined class. Implemented all tuning options from Spark ML for ml_random_forest(), ml_gradient_boosted_trees(), and ml_decision_tree(). Avoid tasks failing under spark_apply() and multiple concurrent partitions running while selecting backend port. Added support for numeric arguments for n in lead() for dplyr. Added unsupported error message to sample_n() and sample_frac() when Spark is not 2.0 or higher. Added support for sparklyr.apply.env. under spark_config() to allow spark_apply() to initializae environment varaibles. Added support for spark_read_text() and spark_write_text() to read from and to plain text files. Addesd support for RStudio project templates to create an "R Package using sparklyr". Fix compute() to trigger refresh of the connections view. Added a k argument to ml_pca() to enable specification of number of principal components to extract. Also implemented sdf_project() to project datasets using the results of ml_pca() models. Added support for additional livy session creation parameters using the livy_config() function. Fix connection_spark_shinyapp() under RStudio 1.1 to avoid error while listing Spark installation options for the first time. Fixed error in spark_apply() that may triggered when multiple CPUs are used in a single node due to race conditions while accesing the gateway service and another in the JVMObjectTracker. spark_apply() now supports explicit column types using the columns argument to avoid sampling types. spark_apply() with group_by no longer requires persisting to disk nor memory. Added support for Spark 1.6.3 under spark_install(). spark_apply() now logs the current callstack when it fails. Fixed error triggered while processing empty partitions in spark_apply(). Fixed slow printing issue caused by print calculating the total row count, which is expensive for some tables. Fixed sparklyr 0.6 issue blocking concurrent sparklyr connections, which required to set config$sparklyr.gateway.remote = FALSE as workaround. Added packages parameter to spark_apply() to distribute packages across worker nodes automatically. Added sparklyr.closures.rlang as a spark_config() value to support generic closures provided by the rlang package. Added config options sparklyr.worker.gateway.address and sparklyr.worker.gateway.port to configure gateway used under worker nodes. Added group_by parameter to spark_apply(), to support operations over groups of dataframes. Added spark_apply(), allowing users to use R code to directly manipulate and transform Spark DataFrames. Added spark_write_source(). This function writes data into a Spark data source which can be loaded through an Spark package. Added spark_write_jdbc(). This function writes from a Spark DataFrame into a JDBC connection. Added columns parameter to spark_read_*() functions to load data with named columns or explicit column types. Added partition_by parameter to spark_write_csv(), spark_write_json(), spark_write_table() and spark_write_parquet(). Added spark_read_source(). This function reads data from a Spark data source which can be loaded through an Spark package. Added support for mode = "overwrite" and mode = "append" to spark_write_csv(). spark_write_table() now supports saving to default Hive path. Improved performance of spark_read_csv() reading remote data when infer_schema = FALSE. Added spark_read_jdbc(). This function reads from a JDBC connection into a Spark DataFrame. Renamed spark_load_table() and spark_save_table() into spark_read_table() and spark_write_table() for consistency with existing spark_read_*() and spark_write_*() functions. Added support to specify a vector of column names in spark_read_csv() to specify column names without having to set the type of each column. Improved copy_to(), sdf_copy_to() and dbWriteTable() performance under yarn-client mode. Support for cumprod() to calculate cumulative products. Support for cor(), cov(), sd() and var() as window functions. Support for Hive built-in operators %like%, %rlike%, and %regexp% for matching regular expressions in filter() and mutate(). Support for dplyr (>= 0.6) which among many improvements, increases performance in some queries by making use of a new query optimizer. sample_frac() takes a fraction instead of a percent to match dplyr. Improved performance of sample_n() and sample_frac() through the use of TABLESAMPLE in the generated query. Added src_databases(). This function list all the available databases. Added tbl_change_db(). This function changes current database. Added sdf_len(), sdf_seq() and sdf_along() to help generate numeric sequences as Spark DataFrames. Added spark_set_checkpoint_dir(), spark_get_checkpoint_dir(), and sdf_checkpoint() to enable checkpointing. Added sdf_broadcast() which can be used to hint the query optimizer to perform a broadcast join in cases where a shuffle hash join is planned but not optimal. Added sdf_repartition(), sdf_coalesce(), and sdf_num_partitions() to support repartitioning and getting the number of partitions of Spark DataFrames. Added sdf_bind_rows() and sdf_bind_cols() -- these functions are the sparklyr equivalent of dplyr::bind_rows() and dplyr::bind_cols(). Added sdf_separate_column() -- this function allows one to separate components of an array / vector column into separate scalar-valued columns. sdf_with_sequential_id() now supports from parameter to choose the starting value of the id column. Added sdf_pivot(). This function provides a mechanism for constructing pivot tables, using Spark's 'groupBy' + 'pivot' functionality, with a formula interface similar to that of reshape2::dcast(). Added vocabulary.only to ft_count_vectorizer() to retrieve the vocabulary with ease. Implemented residuals() and sdf_residuals() for Spark linear regression and GLM models. The former returns a R vector while the latter returns a tbl_spark of training data with a residuals column added. Added ml_model_data(), used for extracting data associated with Spark ML models. The ml_save() and ml_load() functions gain a meta argument, allowing users to specify where R-level model metadata should be saved independently of the Spark model itself. This should help facilitate the saving and loading of Spark models used in non-local connection scenarios. ml_als_factorization() now supports the implicit matrix factorization and nonnegative least square options. Added ft_count_vectorizer(). This function can be used to transform columns of a Spark DataFrame so that they might be used as input to ml_lda(). This should make it easier to invoke ml_lda() on Spark data sets. Implemented tidy(), augment(), and glance() from tidyverse/broom for ml_model_generalized_linear_regression and ml_model_linear_regression models. Implemented cbind.tbl_spark(). This method works by first generating index columns using sdf_with_sequential_id() then performing inner_join(). Note that dplyr _join() functions should still be used for DataFrames with common keys since they are less expensive. Increased default number of concurrent connections by setting default for spark.port.maxRetries from 16 to 128. Support for gateway connections sparklyr://hostname:port/session and using spark-submit --class sparklyr.Shell sparklyr-2.1-2.11.jar <port> <id> --remote. Added support for sparklyr.gateway.service and sparklyr.gateway.remote to enable/disable the gateway in service and to accept remote connections required for Yarn Cluster mode. Added support for Yarn Cluster mode using master = "yarn-cluster". Either, explicitly set config = list(sparklyr.gateway.address = "<driver-name>") or implicitly sparklyr will read the site-config.xml for the YARN_CONF_DIR environment variable. Added spark_context_config() and hive_context_config() to retrieve runtime configurations for the Spark and Hive contexts. Added sparklyr.log.console to redirect logs to console, useful to troubleshooting spark_connect. Added sparklyr.backend.args as config option to enable passing parameters to the sparklyr backend. Improved logging while establishing connections to sparklyr. Implemented new configuration checks to proactively report connection errors in Windows. While connecting to spark from Windows, setting the sparklyr.verbose option to TRUE prints detailed configuration steps. Added support for jar_dep in the compilation specification to support additional jars through spark_compile(). spark_compile() now prints deprecation warnings. Added download_scalac() to assist downloading all the Scala compilers required to build using compile_package_jars and provided support for using any scalac minor versions while looking for the right compiler. Improved backend logging by adding type and session id prefix. copy_to() and sdf_copy_to() auto generate a name when an expression can't be transformed into a table name. Implemented type_sum.jobj() (from tibble) to enable better printing of jobj objects embedded in data frames. Added the spark_home_set() function, to help facilitate the setting of the SPARK_HOME environment variable. This should prove useful in teaching environments, when teaching the basics of Spark and sparklyr. Added support for the sparklyr.ui.connections option, which adds additional connection options into the new connections dialog. 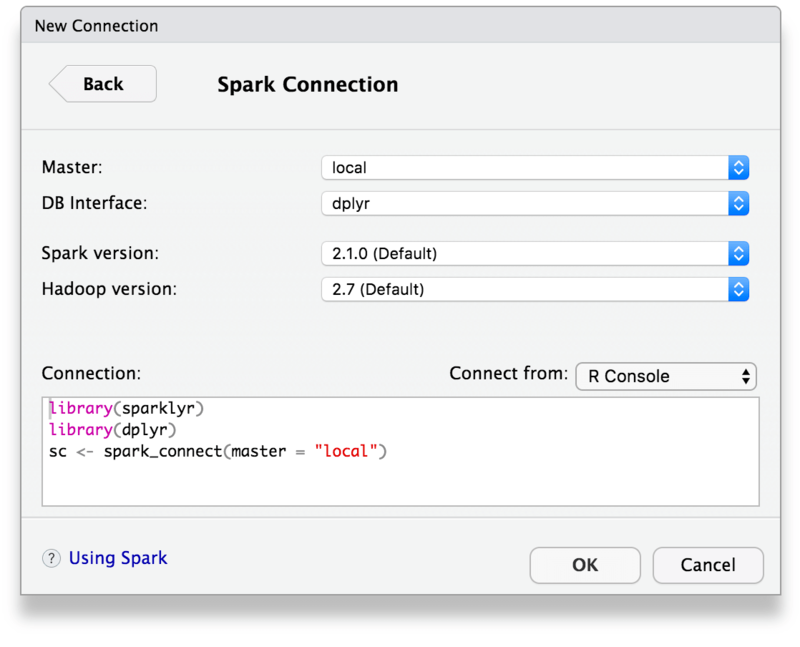 The rstudio.spark.connections option is now deprecated. Implemented the "New Connection Dialog" as a Shiny application to be able to support newer versions of RStudio that deprecate current connections UI. When using spark_connect() in local clusters, it validates that java exists under JAVA_HOME to help troubleshoot systems that have an incorrect JAVA_HOME. Improved argument is of length zero error triggered while retrieving data with no columns to display. Fixed Path does not exist referencing hdfs exception during copy_to under systems configured with HADOOP_HOME. Fixed session crash after "No status is returned" error by terminating invalid connection and added support to print log trace during this error. compute() now caches data in memory by default. To revert this beavior use sparklyr.dplyr.compute.nocache set to TRUE. spark_connect() with master = "local" and a given version overrides SPARK_HOME to avoid existing installation mismatches. Fixed spark_connect() under Windows issue when newInstance0 is present in the logs. Fixed collecting long type columns when NAs are present (#463). Fixed backend issue that affects systems where localhost does not resolve properly to the loopback address. Fixed issue collecting data frames containing newlines \n. Spark Null objects (objects of class NullType) discovered within numeric vectors are now collected as NAs, rather than lists of NAs. Fixed warning while connecting with livy and improved 401 message. Fixed issue in spark_read_parquet() and other read methods in which spark_normalize_path() would not work in some platforms while loading data using custom protocols like s3n:// for Amazon S3. Resolved issue in spark_save() / load_table() to support saving / loading data and added path parameter in spark_load_table() for consistency with other functions. 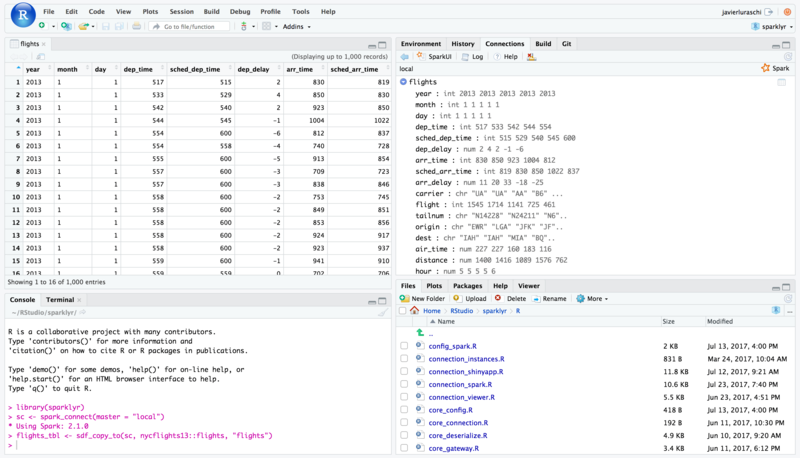 Implemented support for connectionViewer interface required in RStudio 1.1 and spark_connect with mode="databricks". Implemented support for dplyr 0.6 and Spark 2.1.x. Implemented support for DBI 0.6. Fix to spark_connect affecting Windows users and Spark 1.6.x. Fix to Livy connections which would cause connections to fail while connection is on 'waiting' state. Implemented basic authorization for Livy connections using livy_config_auth(). Added support to specify additional spark-submit parameters using the sparklyr.shell.args environment variable. Renamed sdf_load() and sdf_save() to spark_read() and spark_write() for consistency. The functions tbl_cache() and tbl_uncache() can now be using without requiring the dplyr namespace to be loaded. spark_read_csv(..., columns = <...>, header = FALSE) should now work as expected -- previously, sparklyr would still attempt to normalize the column names provided. Support to configure Livy using the livy. prefix in the config.yml file. Implemented experimental support for Livy through: livy_install(), livy_service_start(), livy_service_stop() and spark_connect(method = "livy"). The ml routines now accept data as an optional argument, to support calls of the form e.g. ml_linear_regression(y ~ x, data = data). This should be especially helpful in conjunction with dplyr::do(). Spark DenseVector and SparseVector objects are now deserialized as R numeric vectors, rather than Spark objects. This should make it easier to work with the output produced by sdf_predict() with Random Forest models, for example. Implemented dim.tbl_spark(). This should ensure that dim(), nrow() and ncol() all produce the expected result with tbl_sparks. Improved Spark 2.0 installation in Windows by creating spark-defaults.conf and configuring spark.sql.warehouse.dir. Embedded Apache Spark package dependencies to avoid requiring internet connectivity while connecting for the first through spark_connect. The sparklyr.csv.embedded config setting was added to configure a regular expression to match Spark versions where the embedded package is deployed. Increased exception callstack and message length to include full error details when an exception is thrown in Spark. Improved validation of supported Java versions. The spark_read_csv() function now accepts the infer_schema parameter, controlling whether the columns schema should be inferred from the underlying file itself. Disabling this should improve performance when the schema is known beforehand. Added a do_.tbl_spark implementation, allowing for the execution of dplyr::do statements on Spark DataFrames. Currently, the computation is performed in serial across the different groups specified on the Spark DataFrame; in the future we hope to explore a parallel implementation. Note that do_ always returns a tbl_df rather than a tbl_spark, as the objects produced within a do_ query may not necessarily be Spark objects. Improved errors, warnings and fallbacks for unsupported Spark versions. sparklyr now defaults to tar = "internal" in its calls to untar(). This should help resolve issues some Windows users have seen related to an inability to connect to Spark, which ultimately were caused by a lack of permissions on the Spark installation. Added sdf_persist() as a wrapper to the Spark DataFrame persist() API. Resolved an issue where predict() could produce results in the wrong order for large Spark DataFrames. Implemented support for na.action with the various Spark ML routines. The value of getOption("na.action") is used by default. Users can customize the na.action argument through the ml.options object accepted by all ML routines. On Windows, long paths, and paths containing spaces, are now supported within calls to spark_connect(). Added support to configure Ppark environment variables using spark.env. * config. Added support for the Tokenizer and RegexTokenizer feature transformers. These are exported as the ft_tokenizer() and ft_regex_tokenizer() functions. Added support to parameterize network timeouts using the sparklyr.backend.timeout, sparklyr.gateway.start.timeout and sparklyr.gateway.connect.timeout config settings. Added sparklyr.gateway.port and sparklyr.gateway.address as config settings. The spark_log() function now accepts the filter parameter. This can be used to filter entries within the Spark log. Increased network timeout for sparklyr.backend.timeout. Moved spark.jars.default setting from options to Spark config. sparklyr now properly respects the Hive metastore directory with the sdf_save_table() and sdf_load_table() APIs for Spark < 2.0.0. Added sdf_quantile() as a means of computing (approximate) quantiles for a column of a Spark DataFrame.